This incredible experience and learning opportunity was generously sponsored by the North Carolina Department of Agriculture. All thoughts and opinions are my own. I'm so excited to finally start sharing my Western North Carolina Farm Tour with you! I learned so much during this experience about our fantastic local produce and products here in North Carolina. In fact, I learned SO much, I’m going to separately post about my experience at each farm in a series of posts versus all in one post. I have too many thoughts and things to share with you. To cram everything into one posts would be a ridiculously long read! Since we’re all about maximizing time and efficiency, I’ll share my first and one of my favorite farm experiences with you today. Now, before I dive into a recap of my experience, I thought I'd take a quick moment to share a few life updates of what's going on with Cheers Years HQ and where in the world I've been the past few weeks. I'll admit we were looking in a lot of different locations to buy a home. We looked both inside & outside of North Carolina and to be honest with you, Durham took us by surprise. We just loved the sense of place and the vibe we got hanging out in Durham. The culture, the art, the people, the FOOD… Oh my goodness, the food. We were smitten! We felt like our interests and values aligned perfectly with what Durham has to offer as a community. Plus, it allowed us to still remain close to our best friends and family. One of those travel trips amidst packing for the move was this Western North Carolina Farm Tour. Even though I knew the travel dates of this tour were smack-dab in the middle of our packing schedule, I really felt the pull to go. As a self-proclaimed southern veg-head, I was practically giddy to get a first-hand look into the local vegetable farms in NC. PLUS, there was a water buffalo cheese farm stop. I mean, come ON how cool is that?! It's not every day that you get an opportunity to see water buffalo. With all that in mind, I left the packing stress behind and set out on this incredible journey I'm thrilled to share with you. 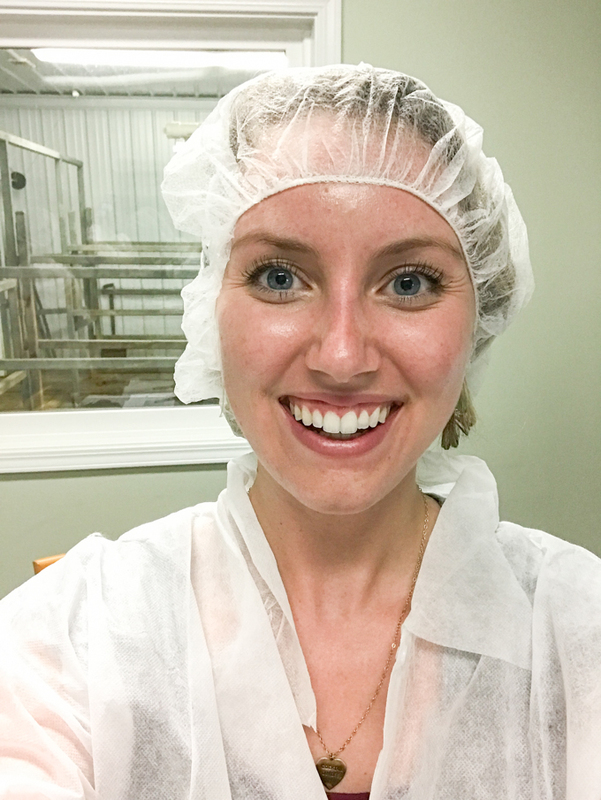 I noticed on the informational emails leading up to the event that the other bloggers joining on this farm tour were also NC food bloggers like me. I was thrilled to meet/see all of them! A few of them I'd met before at other events but it was awesome getting to spend time around fellow foodies. The best (and funniest) thing about hanging out with other food bloggers is that everyone understands and abides by the "no one eats the food until we take a photo” rule. Haha! We rode together from place to place and some of the conversation topics included how to make sweet potato toast and best practices for food blogging. It was especially cool for me to travel with these well-seasoned (no pun intended :) ) food bloggers that had been doing it for awhile. They were very genuine and shared some fantastic advice with me. Not only was the tour itself informative, tasty, and fun, but an added benefit for me was the live connection with fellow bloggers. I could go on and on about the importance of real-life meeting/networking. In my opinion, it will always be the superior form of connection that leads to opportunities. Riding in a car chatting enthusiastically about what we saw followed by moments of silence to document our thoughts and post to social media was both hilarious and awesome. 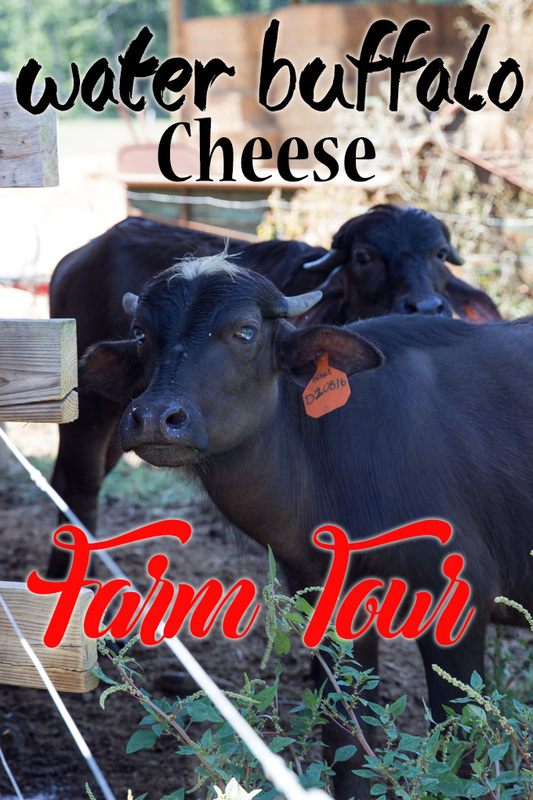 First stop, water buffalo and learning about their cheese at Fading D Farm. Let me tell you why I’m so excited about their cheese and sharing it with you. As a health nut, I learned some pretty awesome facts about this cheese. Water buffalo cheese has something called an A2 protein, which has 30% more protein than regular cow’s milk. This means it’s great cheese for those (like me) who are dairy/lactose-sensitive. You can eat this cheese without the tummy troubles later – SCORE! They’ve only been operating the farm for 3 years and are already producing award-winning cheeses. I can personally vouch for the deliciousness of these little morsels of gold. Each variety had the salty savor of a traditional mozzarella or Parmesan cheese, but with that slightly sweet and tangy taste, similar to goat cheese. One thing I noticed right off the bat was how curious these water buffalo were to see us when we arrived. They ran right up to the gate when we walked up as if to say, "Hi there! Who are y'all?". I've seen cows and baby calves before and thought they were kind of cute, but these water buffalo ladies (and few gents) were adorable! Even with mud all over their backs and horns, they reminded me of big dogs. I'm not kidding, they were that sweet. These guys & gals were doing the mud masks before it was cool. :) I learned that water buffalo don't sweat, so they roll around in mud to cool themselves down. They like to hang out in places where they can submerge themselves in this cool muddy water. That is how they got their name of water buffalo. Makes sense, right? I love the story of how the couple that started Fading D Farm, David and Faythe DiLoreto, found themselves in the cheese making business. They took a trip to Italy after David’s physician retirement and discovered one of the most delicious cheese they’d ever tasted, the Mozzarella di Bufala. When they got back home to the states, it was extremely hard for them to source any of this specialty cheese. Instead of overnight ordering a package every time they craved it they thought, “why don’t we just try to make it ourselves”? So, they bought a small herd of water buffalo and dove right into it. What a courageous attitude! 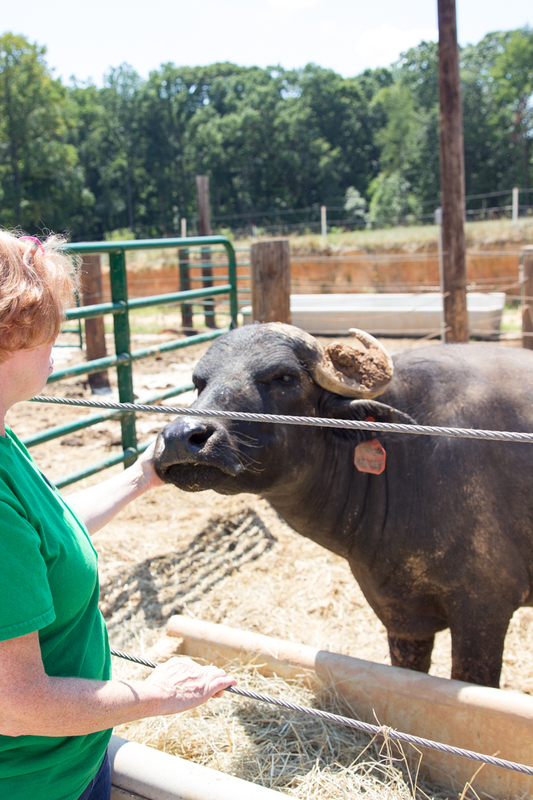 David and Faythe raised these water buffalo that are milked as babies, so they have a very close bond. The water buffalo run up to them when they see them passing by the fence outside. They also lean into their hands when they reach out for a rub on the nose. That’s why I said earlier that these water buffalo reminded me of big dogs. The obvious bond between them and the DiLreto’s was enough to make all of us say “Awww” out loud, more than once. This farm is incredible! I was amazed at how spacious and beautiful the farm was with rolling hills of green grass. We toured the outside areas where the buffalo spent the majority of their time grazing & playing. Then, we moved into the milking room and onto the cheese-making room. During the transition between the farm, the milking room, & the cheese room, we walked through sanitizing solution several times. We also had to put on a paper gown, hair net, and scrubbed our hands before we were allowed in the cheese-making room. These ladies are milked two times a day and produce about a gallon of milk each day. All of their milk is stored and stays onsite at the farm and used to make the delicious cheese. Twice a week, Faythe spends an entire day making the cheeses. Then, cheese are aged in a special room until they reach their final taste quality. Fading D Farm is 1 of only 6 water buffalo farms in the US, which I thought was amazing! If you live in the southeast like me, what an exclusive opportunity we have for a very cool day trip. There is love poured into every element of this farm. From the bond the water buffalo share with the DiLreto’s to the extended time that goes into making their artisanal cheeses, this place radiates good vibes. If you’re a cheese lover or just an epicurean foodie in the south, I would highly recommend making a visit to this farm. It wold be such a cool day date with your friends or significant other. The great news – you can buy Fading D Farms cheese at select farmers markets and specialty stores in NC. I found their cheese in Weaver Street Market in Carrboro. You can check out all the locations you can find them here. John is a cheese fanatic, so when I brought some home for him to try, he loved it! So far, I’ve enjoyed their cheese in a variety of ways. I’ve eaten it by itself just as a snack by simply cutting small chunks. I’ve also shaved some to put on top of salads and pasta. All of the ways I’ve used it were winners. I’m so excited to add another cheese into my daily eating other than goat cheese, since I’m sensitive to most dairy cheeses. Overall, I absolutely loved my experience at Fading D Farm and can’t wait to use their cheese more in future recipes! Would you try this cheese or go make a visit to see these cuties? I’d love to know your thoughts. Comment below and let me know! Here's to local cheese that are made with love... Cheers!